If you read the last installment of the good old Astro Blog, you know I am a proponent of shorter (60 – 120-second) sub-frame exposures for astrophotography. When appropriate. Like from a light polluted site. There are times when you want to go longer, to 300-second or 600-second or longer sub-frames, however. Say when you are at your dark site and want to pick up as many details in the target object as possible. Some of you, especially cheapskates like me who use inexpensive mounts like my Celestron Advanced VX German equatorial mount (GEM), are afraid of longer exposures. How can you break the 300-second barrier without getting trailed stars? There are ways to do that fairly easily. Good polar alignment is one. Spending time tweaking the settings in your auto-guide program is another. One other thing that is often overlooked and unused, but which can maybe get you the last step on the road to longer subs, is PEC. Yeah, PEC, aka “PPEC.” You know what that is doncha? You don’t? Well, PEC, “periodic error correction,” was an idea that came out of the early 1990s, when microprocessors and memory chips not only came down in price, but began to appear in telescopes. I don’t know who originally came up with the idea, but it was a good one. In those days, we amateurs were still guiding manually. You’d monitor a guide star in the guide scope or off axis guider with a cross-hair reticle eyepiece. 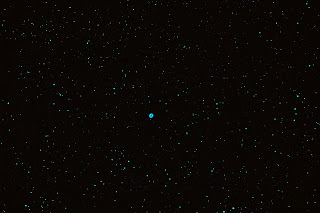 When the star wandered away from the center due to the inevitable “periodic” errors in the mount’s gears, or drifted north or south due to polar alignment error, you pushed a button on the hand control (which we still called a hand “paddle”) to move that pesky star back to the cross-hairs. You did this over the duration of a long deep sky photographic exposure, which in the days of film was likely at least half an hour. The good idea represented by PEC was this: What if there were a way to record your button pushes? Record your corrections for that periodic error and play them back? That would, if nothing else, make guiding easier. Thanks to the recurring—periodic—nature of the gear error in worm gear sets, which is what most of us were using by then, it sounded like PEC could indeed work. Again, I am not sure who came up with the PEC idea, but the first people to implement it in a commercial telescope were Celestron, the old American based (though Swiss owned) Celestron out of Torrance, California. They brought PEC to the market initially with their top of the line C8 Schmidt Cassegrain, the Ultima 8, in a new version of the telescope, the Ultima 8 PEC. It just so happened that not long after the final and best version of that telescope was released, the 9-volt battery powered Ultima 8 (PEC), I was in the market for a slightly upscale SCT. Well, as upscale as penny-pinching me ever goes. 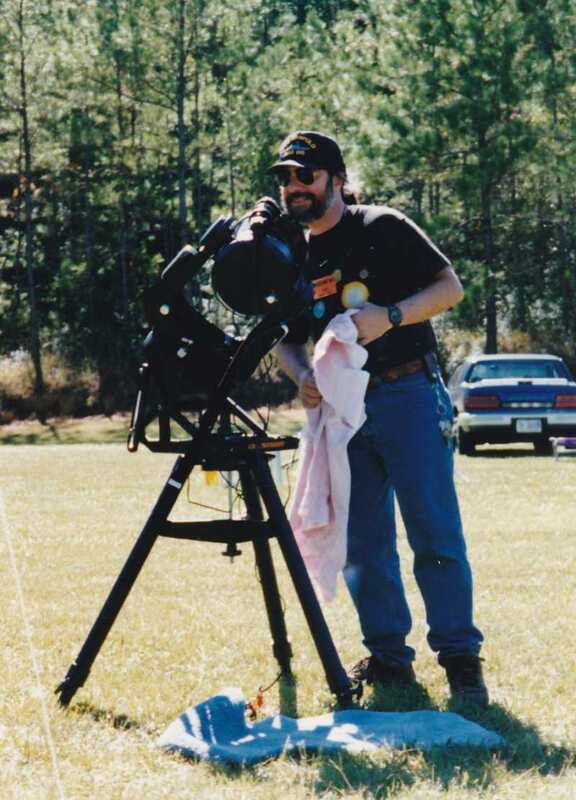 By the spring of 1995, I finally had an Ultima of my own, and after buying a few rather expensive (I thought) accessories like a declination drive motor (optional in those days) and a counterweight and rail for this fork mount scope, I undertook to do some deep sky imaging. I was curious to see if PEC really took the pain out of guiding. What I found was that it helped. You certainly could not expect to go unguided with the C8 at 1500mm (at f/6.3) for over a minute or two—not long enough to accomplish much with film—but it did make guiding less arduous. You still had to watch the guide star, but if you did a good PEC recording, you would usually be OK if you looked away from the reticle for a moment or your attention wandered. The periodic error was still there, but its magnitude was lessened. 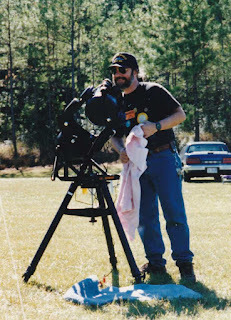 Celestron’s PEC implementation was certainly not the end of manual guiding. Naturally, it only recorded your east-west corrections. Any errors in declination are not periodic; they are due to polar alignment error or seeing, not periodic error. Too bad I was always rather lazy about polar alignment in those days. That meant I still had to monitor the guide star attentively. Also, Celestron’s version of PEC left a little to be desired. Mainly because you had to do a brand-new recording every single night. It was a shame you couldn’t save an especially good PEC track for future use. Turn off the scope at the end of the evening, and your PEC recording disappeared into the ozone. Nevertheless, I used PEC to the end of the film days, and it did improve my photos, no doubt about that. But when electronic cameras and auto-guiding came in, I forgot all about PEC. Yes, there had been improvements in it—Meade and, finally, Celestron had equipped their mounts with PPEC, permanent periodic error correction. With PPEC, your recording was preserved through power cycles. But why worry with PEC since you had a guide camera and a computer watching that guide star now? There was also an old wives’ tale making the rounds. That PEC and an auto-guider would FIGHT each other. That the auto guider and PEC would conflict, one wanting to correct this much and the other that much; one wanting to go in this direction, and the other in that. Some of those old wives were pretty sharp, but this particular tale doesn’t really make a heck of a lot of sense when you think about it. Nevertheless, for a while it was the conventional wisdom astrophotographers embraced. I just sort of accepted it—when I thought about PPEC at all, which was seldom. I was auto-guiding and that always seemed to be enough. Well, I thought it was enough, anyway. 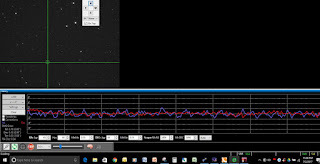 Auto-guiding with my Advanced VX GEM with my QHY-5L II camera and PHD2 resulted in an RMS error around 2” usually. That was good enough for my most used telescopes, my 80mm and 120mm f/7 ED refractors and my DSLRs. There were some occasional R.A. spikes, though, and at times the error would climb above 2”. What could I do to improve on that error figure? One thing I’d avoided doing since buying the VX: spending some time fine-tuning those blasted PHD2 brain settings, the settings in the program that modify the guiding algorithm. I’d pretty much left them on their defaults other than just increasing the guide-step size to accommodate my fast 50mm guide scope. So, I finally buckled down and took one whole night where I did absolutely nothing but tweak PHD settings. The result? My guiding was now smoother. The spikes were gone, and I rarely had an error above 2”; usually it was 1.5” or just a bit more. The elimination of the spikes meant I could now do longer exposures without having to throw out more than a few subs. And then I got to thinking. Why should I stop there? If I could get that error just a little lower, it would make imaging with my Edge 800 (at f/7) easier. But how to do that? I’d worked hard on those PHD settings, and had also begun using Sharpcap’s polar alignment tool in lieu of the less accurate ASPA polar alignment in the NexStar HC—that really brought the declination error down. What else could I do, though? Well, how about PPEC? If it helped A-P’s fancy mounts, which come with factory recorded PPEC to lower their already impressive error figures, why couldn’t it help my plebian (like me) mount? I decided to find out. Luckily, we were undergoing a strangely cloud-free pause in the usual summer evening thunderstorms. My VX along with my 120mm SkyWatcher ED refractor, Hermione, was still set up in the backyard, polar aligned, goto aligned (hibernated), and ready to rock following the night of my Yearly M13. Since the evening didn’t look that good for imaging—haze and also unsteady seeing in advance of the next storm front—why not devote it to PEC? After all, I’d spent a whole evening getting my PHD2 settings tuned to the VX. OK, so how exactly would I make a latter-day PEC recording? I’d taken a brief look at the short set of instructions in the VX manual and concluded there really wasn’t much to it. The process wasn’t much different from back in the day except for the fact that PHD2 Guiding would be doing the “button pushing” and not me (thank God). Since I guide via the mount’s auto-guide port with an ST-4 cable, the set up was simple. No need to worry about ASCOM or anything like that. While the book instructs you to use a bright star for guiding when PEC recording, there’s no reason for that with today’s sensitive guide cameras. 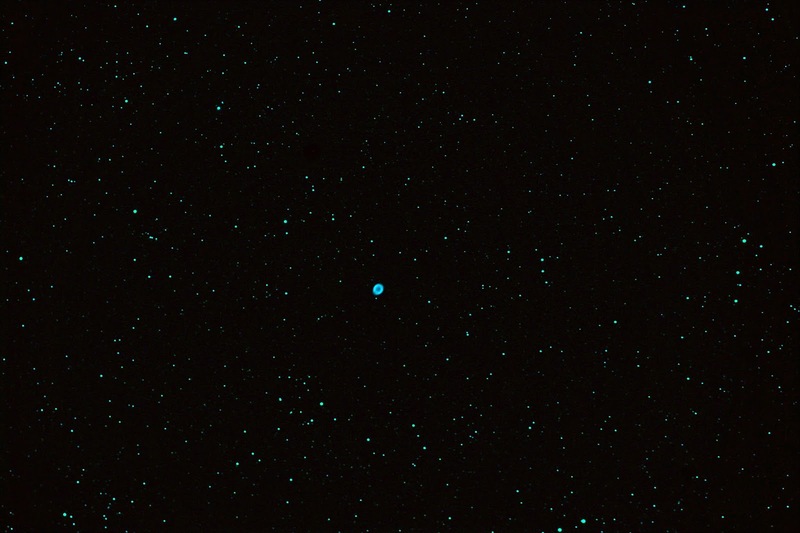 I pointed the scope at the field of M57 and there were dozens of good guide star candidates. Some folks will also tell you that for best PEC results you need to make the recording using a star near the Celestial Equator. That is also untrue. It really doesn’t make any difference. Step one, it appeared, was “indexing,” allowing the mount’s PEC routine to find the worm gear “index,” a marked point on the worm that is picked up by a sensor. For PEC to work, the hand control has to match the gear to the recording every time you use PEC, the gear and the recording must be synchronized. Indexing does that. Anyhow, I selected PEC in the Utility menu, and hit enter. The mount then indexed, which only took a second or two (if the worm has to rotate far to bring the index mark to the sensor, the mount will move slightly). Time to record. Over at the PC, I started PHD2 guiding on my pre-selected guide star. I gave it a little while to settle down, returned to the mount, and hit “record.” That began the ten-minute process of making the actual PPEC recording. Unlike the old days, there wasn’t anything for me to do. Assured PHD2 was guiding with its usual alacrity, I headed for the den to cool off from the hot and muggy backyard. The rest was rather anti-climactic. I returned outside ten minutes later, and could see from the HC that the recording was done. Just like with a tape recorder, you don’t just record, you play back. 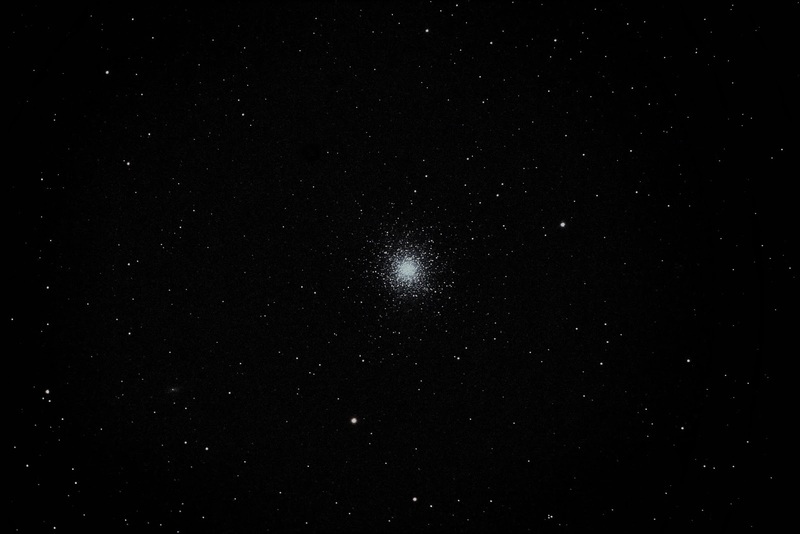 I selected the playback function and let her rip, beginning a 600 second exposure of M57 with the main camera, my Canon 400D. What were the results? Error wise, they weren’t like night and day, but there was a difference. As above, my normal error level with good PHD2 settings and a good polar alignment had been around 1.5”. With PEC playback on, the RMS R.A. and declination error declined to around 1” to about 1.10” with the actual R.A. error almost always well under 1”. 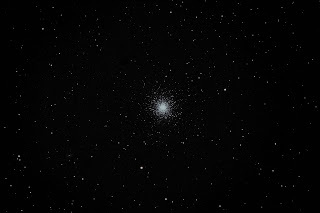 While I was slightly out of focus with the main telescope, the stars in the ten-minute exposure were decently round, as were the stars in a 300” exposure of M13 despite the fact that it had crossed the Meridian and the mount was not balanced properly in R.A. for imaging in the west. My verdict? Recording PEC had been nearly effortless and certainly worth it for a noticeable improvement. Over the last several months, my easy improvements: PHD settings, polar alignment, and PEC have taken my AVX mount from an average total guiding error of 2 – 2.5” to 1”. While I was getting by before, I am certainly doing better now. And the fact that my guiding is now consistently smooth with no excursions mean I am much, much more able to undertake longer exposures, 300-seconds and above, when appropriate. My sense is that as long as balance is reasonable, the mount will guide at the above error level for as long as I want to go. So, am I at the end of my improvements? Maybe, and maybe not. I could certainly leave the AVX alone now. But there is one further “easy” improvement I could essay. My single PEC recording improved the error figure. But averaging several runs and uploading that resulting smoothed curve to the mount might make it even better. Celestron still offers a free program to do that, “Pec Tool” (even though it hasn’t been updated or publicized in a long time). I may be reaching the point of diminishing returns with the VX—1” RMS error is pretty good for a mount in this class—but it might be worthwhile to take this one last step. I’ll let you know how it goes if I decide to do that (ain’t broke/don’t fix it) and if clear skies ever return this summer. It is, yes, raining hard now. There's not much to add to this post from summer before last. I am still amazed at what a few tweaks--a Sharpcap polar alignment, fine tuning my PHD settings, and PPEC--did for the good, old AVX mount. While I now have a beautiful Losmandy GM811 mount, and it is lighter than the old CGEM and Atlas it replaced, it's still a handful for me in these latter days. Luckily, I can accomplish most of my (modest) imaging projects with the AVX, which now guides at 1" or less on a good night. Certainly, I'd prefer not to do imaging with an SCT, even reduced to f/6.3 or f/7, on this mount--though I have done so and had quite acceptable results--but at less than 1000mm with my refractors, the AVX is GOLDEN. Not much to do with PEC, but Happy Birthday Unk! I've been reading your blog since about 2010, on Sunday afternoons after church. It has been a prop to and guidepost for my hobby. Thanks for your skill and wit! May the Lord bless you in the coming year. Hi Rod, Polar align, PHD and PEC is just about what I learning just now. Had a go with the PEC Celestron tool last sunday. Did not came out that good, my DX mount crashed several times because I think the programm starts with a 90° offset. Setup of the pgrm seems OK alltough, uploading not ok. Uncertain were the data is uploaded to, is it stored in the HC or in the mount itself? Could you share your expience with the PEC tool from Celestron? Just re-read this. Get and use PEMPRO! It will record many worm cycles, make a mathematical model, and upload it to your mount.